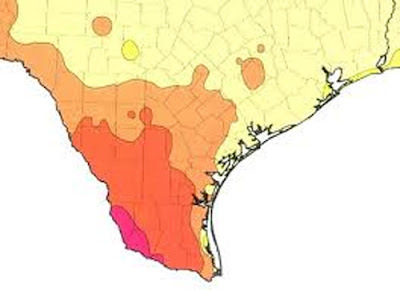 The U.S. Department of Agriculture has declared all of Texas a natural disaster area because of drought and wildfires. Each of 213 counties out of a total of 254 (edited to reflect number of total counties) in the state has lost as much as 30% of its crops. This declaration will make farmers in these counties eligible for low-cost loans and other aid, but I have to agree with the reaction of one of those farmers: "I don't need loans. I need rain!" There's no help for gardeners in this, except for professional, large-scale operations, but I'm happy to see that our brother and sister farmers will be able to tap into additional assistance in coming months. No doubt it will help many of them. Last week's wonderful rain is just a dim and distant memory. The sprinklers are out once again and even plants that normally can stand up to a beating by the weather are beginning to show signs of stress. As I was watering today, I noticed that a couple of my 'Radazz' Knockouts are showing several brown leaves and are looking distinctly peaked. I've not spent much time watering the bed they are in just because I was confident in their ability to tough it out. But even the toughest plants must occasionally have a drink and so I watered the bed deeply today in hopes of giving the plants there a boost. Throughout the yard, plants are shutting down, conserving their energy and their water. In the vegetable garden, just about everything is basically fried. I made zucchini bread for our future breakfasts and fried some yellow squash for lunch today, the last of my squash crop. There are a few more zucchinis on the vines, but they are the size of watermelons. They came on while we were on our trip and nobody picked them. By the time we got home, they were humongous and inedible. About the only things still producing in the vegetable garden are a few of the herbs and my peppers. I told my husband today that maybe in the future I should just specialize in growing peppers. It's the one thing I can be sure of success with in the summer garden, because they do like it hot! Even the sweet peppers like it hot. 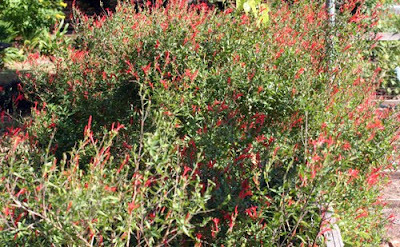 Blooms throughout the garden are in short supply, making the plants that are in bloom doubly important. Nothing seems to daunt the flame acanthus, and a good thing, too. Today I saw a female Ruby-throated Hummingbird sipping from these blossoms. Bees and butterflies visit often, too. The butterfly weed seems to be positively enjoying this weather. Every plant I've got is in full bloom now. 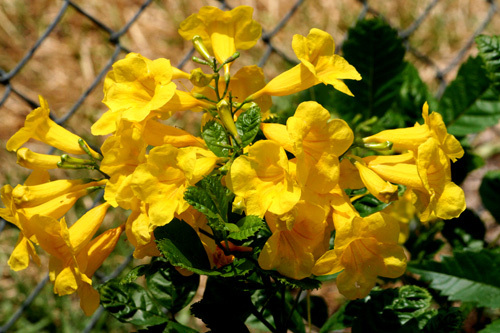 Yellow bells (Esperanza) can take the heat and the drought. And so can yellow cestrum. A few of the daylilies, the red and the white Texas star hibiscus, as well as a couple of other hibiscus plants and a few other plants continue to bloom. The old crinums carry on as if nothing were amiss. But these are the exceptions. Throughout the garden, some plants have taken just about all the abuse they can stand and I'm likely to lose more of them despite my best efforts to keep them hydrated. Looking ahead, I see no relief in sight. It's been a busy week, what with one thing and another - returning from our road trip, enjoying our first real rain in months, running errands here and there, and house-sitting for our daughter who is out of town. So busy that the biggest celestial event of the week went unnoted in the blog. Yes, I am referring to the changing of the seasons from spring to summer. One reason that the change went unnoted was that it was imperceptible. We had, in effect, already been "enjoying" summer for weeks, but it wasn't until 12:16 P.M. last Tuesday, June 21, that it officially arrived. Summer solstice was a huge event in the lives of our ancestors and it is still a huge event in many societies today. Various civilizations have for centuries celebrated the first day of summer, the longest day of the year. In some places, it is known as Midsummer (See Shakespeare's Midsummer Night's Dream.). Some call it St. John's Day, and, for the Wiccans, it is Litha. The word solstice comes from Latin root words which mean "sun" and "to stand still." Ancient people observed that as the days grew longer, the sun rises higher and higher until it seems to stand still in the sky. Here in Texas this spring and now summer, it has often seemed that the sun was standing still high in the sky and would never give us any relief. The summer soltice was and is especially important in the Pagan religion. The day was thought of as the "wedding of Heaven and Earth." They have long celebrated the event with bonfires and it is thought to be a particularly auspicious time for wedding ceremonies. They called the Midsummer moon the "Honey Moon" for the mead that they made from fermented honey and used in their wedding ceremonies. Thus, we have the origin of our own "honeymoon." Midsummer was thought by the ancients to be a time of strong magic. Evil spirits were abroad on that day and to thwart them, people wore protective garlands of herbs and flowers. One of the most powerful of them was an herb called "chase-devil" which we know today as St. John's Wort. 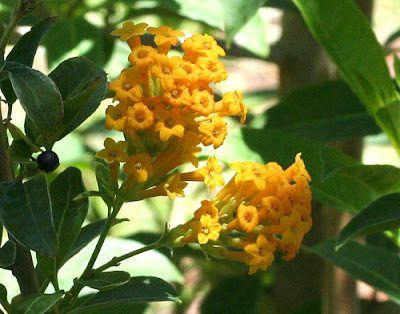 It still has an important spot in our herb gardens and is used by modern-day herbalists as a tranquilizer and mood stabilizer. Perhaps the most important thing for us as gardeners to remember about the summer solstice is that it is, in fact, the longest day of the year and each day now is just a little bit shorter. We may not be able to detect yet but, soon enough, the shadows will be moving and changing, and before you know it, we will be celebrating another changing of the seasons. It will be autumn. We returned from our trip through Louisiana and Mississippi (and flirting with Tennessee) to find our yard even drier than we had left it and wildfires raging in the adjoining counties. And today the hot stuff REALLY begins because this is the first day of summer. Everywhere that we traveled while visiting family and friends, the countryside looked lush and green compared to what we have become used to seeing here. This was true even though some of those places had been dry recently, too. The difference was that they had received plenty of rain in winter and early spring. Along our route through Louisiana, the Atchayfalaya Basin and adjacent swamps and streams were full of water giving a jungle appearance to the land. The Mississippi River was still stretching to the top of its banks, as were most of the smaller rivers along the way. In short, we saw plenty of water and it was a wonderful sight. But it wasn't only rivers, swamps, lakes, and reservoirs. The first night that we spent in North Mississippi, it rained! I cannot even describe what joy it was to hear that sound and see those drops. It rained pretty steadily all night and on until the afternoon of the next day. Area gardeners and farmers could count 1.5 to 2.5 inches of rain, depending on where they were located. Afterward, the countryside looked washed clean in a way that we haven't experienced here at home in Texas in so many months now. Throughout the roadsides that we traveled, black-eyed Susans, Queen Anne's lace, the native butterfly weed and phlox, as well as the naturalized ditch lilies, bloomed in gay profusion. It was enough to gladden the heart of any passing gardener and it certainly gladdened mine. Much as we enjoyed our trip, it is always good to come home again, even to a super-dry garden that seems on the edge of disaster. The weather forecasters assure me there is a chance of rain this week. We'll see. I'm going to be on the road for the next several days and mostly away from my laptop, so posting here will be rare or maybe nonexistent. If I encounter any rain on my travels, I'll try to send it on this way. Keep doing those rain dances and stay cool! When we made a trip to Texas A&M a couple of weeks ago, I couldn't help noticing that many trees along our route seemed to be dead or dying. Since then, I've been paying attention whenever I'm out and about and trying to notice if the trees of our area are losing their battle with the drought. After a trip into Houston today, I've reached the firm conclusion that many of them are. All along the way, I kept seeing trees that had turned brown and appeared dead or were turning brown and seemed to be dying. My observation was that the pines seemed to be the most affected species but other trees were suffering as well. I've even noticed here, near my home, close to Spring Creek, several trees have already turned brown. One would think that trees near the creek would be able to access water and weather the drought, but evidently one would be wrong in that assumption. Of course, the marshy, swampy, backwater areas that border the creek are completely dry now and the creek itself is a mere shadow of its former self. It's getting quite desperate out there. In my own yard, I have many large trees and there is no way I can give them the water that they need. No doubt they take some of the water that I occasionally give to the beds near them, but that is a drop in the proverbial bucket compared to what a big tree needs to live. I can only hope that their roots are deep enough to find the water that they need, and, indeed, so far they all seem to be holding their own. Not my apple tree though. Yesterday, my old apple tree that we planted more than twenty years ago split right down the middle and half of it fell to the ground. I knew that the tree was diseased and I thought that I would probably have to have it taken down next winter, but I was hoping it would make it through this season. It was absolutely loaded with apples as it never had been before. In fact, the weight of the fruit may have been the final straw that contributed to its splitting. I am sure that the lack of water also hastened its demise, even though, as my husband said when he saw it, we knew it was just a matter of time. All the trees are under stress as they struggle to find water and to diminish the lose of water through their leaves, and it is stressful for the gardener, too, knowing that there just isn't much one can do to help the big guys. We can help the smaller trees though, and I have several of those, too - fruit trees and shrubs that I added last winter and early spring. I'm working hard to keep them watered and hoping that I will be able to pull them through. Some have a few brown limbs but so far most seem to be coping. This drought continues to try our nerves and our skills as gardeners as it tries the survival tactics of our trees. Most of my trees are oaks or magnolias - tough guys of the southern landscape. As the drought grinds on, we'll see just how tough they really are. The American Horticultural Society identifies 86 degrees F. as the temperature at which plants start to suffer damage from high temperatures. When you combine high temperatures with prolonged, unrelieved drought, what do you get? Well, looking around my garden, I can tell you. You get plants that are normally considered "tough" that are being stressed to the limits of their endurance. Some of them aren't going to make it. I have already lost more plants to the drought and heat than I lost to the cold in our last two winters. 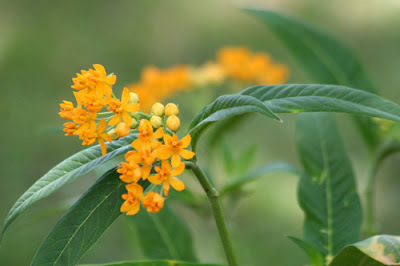 As I was hand-watering some plants in my yard a few days ago, I was surprised to notice that my oldest beautyberry shrub had several brown limbs and appeared to be in dire stress. Yet, about ten feet away, another beautyberry - my white-berried shrub - looked perfectly fine and was full of blooms. Thinking about it, I decided that the old shrub's stress is probably caused by the fact that it is between my apple tree and a cherry tree on my neighbor's side of fence. It's having to fight it out with those two trees for water and it is losing the battle. When temperatures are above 86 and plants are aspirating water through their leaves at a high rate, the battle for water to replenish that moisture can become a fight to the death, and having already hit 100 degrees F. here in early June, that is what I am seeing in my garden. I went looking for more information about plants' ability to withstand heat and found something that, in my ignorance, I didn't know existed. We are all pretty familiar, I think, with the USDA's plant hardiness zone map. Any gardener worth his/her salt can tell you in which zone he/she resides. 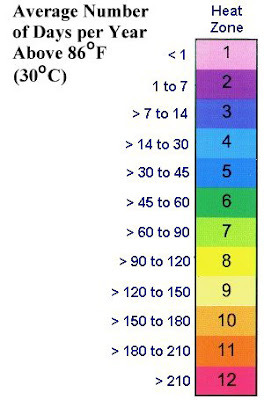 But did you know that there is a heat zone map also? You won't usually see it referred to on plant tags, but it does exist, and the zones are based on the average number of days in the year when the temperature is above 86. Our entire area is in zone 9, which means that we generally have between 120-150 days in the year that are above 86 degrees. I suspect we are going to hit the higher mark or maybe exceed it this year. How does this knowledge help us in our gardening plans and practices? Gardeners could be generally divided into two categories: traditional or daring. Traditional gardeners try to choose plants that they know are suited to their zone and will do well there. Daring gardeners love to push the envelope a bit (or sometimes a lot) and grow plants that are really not meant for their area. Considering those two catergories, I suppose I would be considered traditional, (although in other areas of my life, I like to think of myself as a daring rebel!) but at times like these, even a traditional philosophy of gardening will be tested. I suppose the Anazazi of the arid Southwest, who certainly adhered to a traditional philosophy of farming, must have been tested in much the same way when the long drought that put an end to their blossoming civilization ground on without relief year after dry year. I've been thinking about those Anazazi farmers a lot lately. We certainly have access to a lot more information and a lot more tools than the Anazazi ever did, and no matter what type of gardener you are, looking around a local nursery can lead you to believe that your choices are endless. But knowing something about your hardiness and heat zones can guide you to make wiser choices. And observing the plants in your current garden, the winners and the losers, can give even more guidance when making your future plans. I know I'm going to have a lot to consider before adding any new plants to my garden.